Fendi Chameleon Flap Satchel: What’s In a Name? Ah, the beauty of a Fendi that looks like a Fendi but doesn’t shout FENDI. You know what I mean? This shoulder bag still carries telltale signs it’s from the logo-loving luxury house, but it’s through details only a connoisseur could detect: vague color-blocking and a small, very subtle version of the classic Zucca double-“F” hallmark on the closure. 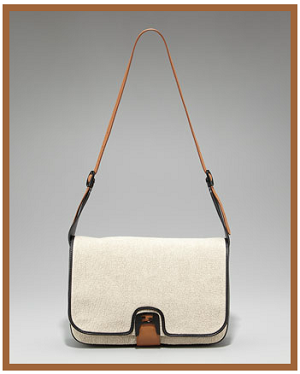 Aptly titled, this nubby ivory canvas satchel is a chameleon in more ways than one. Trimmed in contrasting shiny black leather and topped with natural camel straps, this is a clean and chic kind of sophistication you would never expect from the excess-loving brand. And this simplistic-looking bag does a complex job. It converts from a shoulder bag to a crossbody to a clutch – brilliant! Three internal pockets make for great organization, and the combination of features makes this a handy everyday bag to transition from day to night. A true Resort piece that will happily travel with you to serve multiple functions. Available for pre-order at Bergdorf Goodman for $1,345. Pair with: Become a chameleon yourself with a new pair of shades. 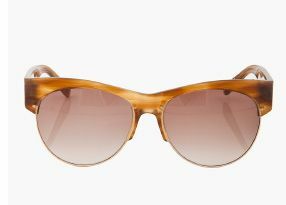 The Row’s Clubmaster shades have a retro vibe that will take you off-guard, with tortoise frames, gradient lenses, and a rose-gold trim. On Ssense for $380.